What’s the Difference Between a Quick Detailer and Waterless Car Wash? One of the most common misconceptions in the car care industry is equating a Quick Detailer/Spray Detailer with a Waterless Car Wash. Let’s be clear, these are two completely different products with two different functions in the detailing world. Quick Detailers were created to give users a fast and effective way to restore a car’s gloss without the hassle of a paste or liquid wax. These products are mainly used on cars that are in ‘showroom’ condition with no visible contaminants on the surface of the paint. They have excellent gloss, protection and lubricity, but lack the cleaning power to go beyond cleaning fingerprints or dust. Waterless Car Wash products are intended to replace a hose and bucket wash. They do share many of the same characteristics of a Quick Detailer, but also are formulated with cleaning agents (surfactants) that can more safely and effectively emulsify contaminants on the surface of the paint. Waterless Car Wash products such as Eco Touch, are safe to use on light-moderately soiled vehicles. Heavy mud, salt or sand needs to be addressed with a pre-rinse before using this method. Cleaning Ability – Daily driving road grime. 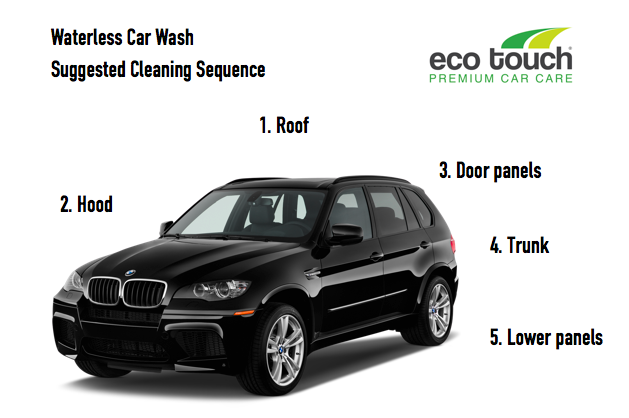 Eco Touch Waterless Car Wash is excellent for cleaning light to moderately soiled vehicles. Let’s start by being clear about something – using a waterless wash product is not hard. I know, it can sound intimidating at the start. Where’s the hose? Where are the suds? But trust me, after cleaning just a few panels you’ll be hooked on the process. The speed at which you are able to simultaneously clean and protect your car in one simple step is quite amazing. To help anyone just getting into this method of washing, we’ve assembled a list of best practices. 1. Work from the top of the car down. Car’s naturally accumulate dirt along the lower body panels and you’ll want to tackle these areas last. Start with the roof->hood->door panels->trunk->lower body panels. Be sure to pay extra attention near wheel wells where heavy debris t.
2. Use quality microfiber towels. Outside of the waterless product you use, make sure you have a good stock of high quality microfiber towels. We suggest towels with a 300 GSM rating, as they offer the best combination of cleaning and polishing. While many people think that using a higher GSM towel is better, it can surprisingly work against you. We’ve found that those fluffy 400+ GSM towels do not clean as effectively as their lower 300 GSM counterparts. 3. Fold your towel in half and half again. You’ll want to maximize the number of sides on your towel. By folding in half twice, you’ll effectively get eight sides to work with. Use at least one side per panel depending on how dirty the vehicle is. 4. Work in small sections. Start with a 2ft x 2ft area for applying and buffing off the waterless formula. If your car is completely cool and relatively clean you may be able to work in larger sections. 5. Wipe in one direction. Follow the contours of the car’s body and wipe in the direction of normal airflow over the panel. 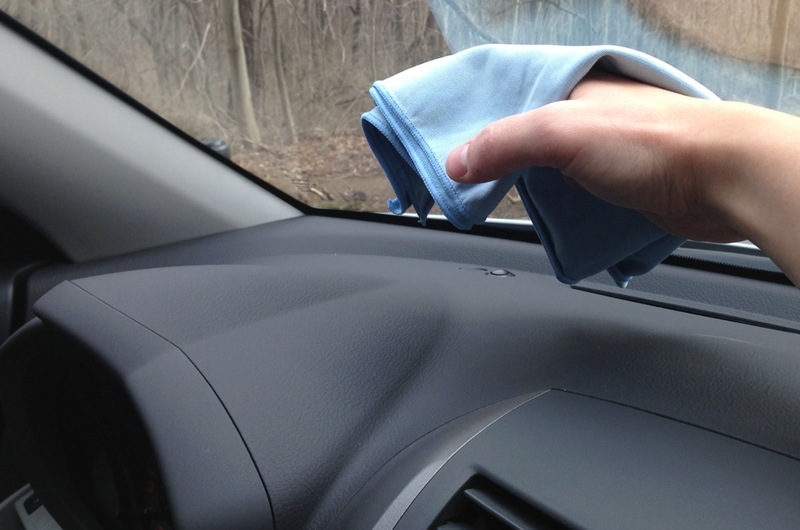 This will help prevent re-soiling the areas of the car you’ve already cleaned. You should not use a circular buffing motion as if you were using a wax. 6. Apply light pressure on first stroke to remove contaminants. You’ll want to apply light pressure on your first pass over the panel. We suggest using the wipe and ‘lift’ technique where you are simultaneously rotating the towel while wiping across the surface. 7. Keep your buffing towel separate, clean and dry. Pick one set of towels for the cleaning and one for buffing. For best results you want to have your buffing towels near 100% dry. 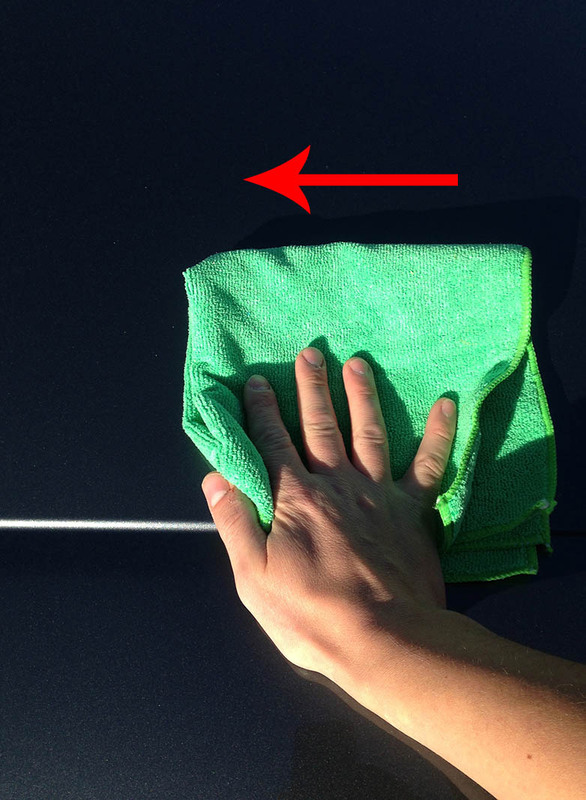 Many times we’ve seen detailers use two towel colors so it’s easy to remember which is which. Eco Touch manufactures a complete line of professional detailing supplies in Dover, NH. We are a family owned and operated company since 2007. Have any other questions? Call us today at 888.375.7970. Any competent detailing company will carry what’s known as ‘garage keepers’ insurance. Like in any industry, accidents do unfortunately happen from time to time. Whether it’s from the detailing process itself such as damage to the paint or while moving your vehicle in and out of the shop, it’s important for any professional detailing company to have themselves (and you) covered. 2) What chemicals/products do you use? We spend an amazing amount of time in our cars these days. Whether you’re just commuting to work or moving the kids around, it’s important to know what chemicals have been used during the detailing process. Many traditional detailing products contain cheap ingredients which can lead to health problems with prolonged exposure. Make sure you ask your detailer for MSDS sheets so you can confirm for yourself what’s being used around you and your family. 3) Do you have any customer referrals? Here you could simply start by asking the company directly for customers who’ve received a similar service. Of course, the detailing company will likely just refer you out to satisfied clients, so you may want to go on the web and check out websites such as yelp.com or bbb.org to get a more realistic picture of company’s rating. 4) How long should I expect the protectants and coatings to last? Depending on the service level you select, most detailing companies will apply sealants and protectants to your vehicle. Get a clear understanding and expectation of how long these should last. Be wary of any company that claims a protectant/sealant will last for 6+ months as the majority of products on the market today will begin to degrade after 2 – 3 months from application. 5) What is included/not included with my service package? Make sure you fully understand what you’re paying for. Many times a company will have you bring your vehicle to the shop first for a walkthrough to address any areas which will take extra time and incur additional fees. Excessive pet hair, odors, stains, damaged/scratched paint will certainly be addressed prior to starting the work so you’re not left with a surprise bill at the end of your detail. Keeping your car’s wheels clean isn’t just about looks, it also prevents damage from taking place. Every time you drive your vehicle brake dust is created from the friction between the brake pad and the rotor. If left untreated, these tiny particles will accumulate and slowly eat away at the coating and eventually pit your wheels. Eco Touch Wheel Cleaner was designed to quickly and safely remove all types of brake dust from your wheels. Traditionally, car enthusiasts and detailers would rely on harsh acids (hydrofluoric and sulfuric) to do the job. While these products are effective they have serious health concerns and when used improperly they can actually do more damage to the wheel itself. Eco Touch Wheel Cleaner uses a proprietary mix of plant-based cleaning agents and natural citric acid to effectively clean car wheels. For 2013 we also changed out the sprayer head which creates a generous amount of foam when the product is applied. Start by spraying down the wheel completely and letting it dwell on the surface for a minimum of 30 seconds. You can also use Wheel Cleaner on the rubber tire if it needs cleaned. After the product has been allowed to work on the surface, take a towel (microfiber or terry) and wipe clean. Quick tip – some detailers prefer using a soft wheel brush as this aids the cleaning process and removes heavily soiled areas more effectively. While many traditional products state the wheel should be ‘rinsed’ clean, we do not recommend this practice! The highly toxic brake-dust mixture is a complete hazard for the environment and should never be directly released. Alternatively, we suggest wiping the wheel clean and laundering as normal. That’s it, you’re done with the cleaning process! If you wish to add a protectant to help prevent future build-up, we suggest applying either Eco Touch Waterless Car Wash or Quick Wax. Both contain polymers that are safe for wheel finishes and will give a nice shine. Eco Touch makes a full range of wheel cleaning products available in 24 oz. and 1-gallon re-fills. Purchase online at ecotouch.net. Is a Waterless Car Wash Right for Your Detailing Business? While waterless car washing has been taking off in recent years, many detailers (both veteran and newcomers) are not always certain if it is the right fit for their business. The following is a list of ways to know if using this exciting new technology is a good fit for your business. 1. Municipal regulations restrict detailers from openly discharing water into storm drains. This is a big one many new detailers forget about. It’s vital you check with your local/state government to see what regulations are in-place regarding water run-off. We’ve received numerous calls from detailers who have been levied hefty fines from environmental agencies. Many states on the West Coast (California, Oregon, Washington) have implemented strict guidelines which prohibit detailers from washing cars and openly discharing soapy wastewater. 2. Keeping startup costs low. Alternatively, starting up a detailing business with a waterless car wash product can cost less than $100. Seriously. The fact that you don’t need to haul around a large water tank immediately opens up possibilities. Live in an urban area? You wouldn’t even need a vehicle to haul around all that water. 3. Meeting consumer demands for green products. When ‘green’ automotive products first came on the scene in 2007 many traditionalists in the automotive industry immediately wrote them off. “Oh it’s just a fad, wait a few years and it will go away”. Well, here we are in 2013 and we continue to see strong demand from consumers for these types of products. Consumers want to feel that they are making a difference, whether that’s in the products they buy or the services they offer. They key here is not making them pay more for it. When we get asked “how much should I price my detailing services at” we always suggest looking at local competition and doing a quick survey of potential consumers. Many times you’ll find that consumers expect to pay the same as what a traditional detail would cost. These are just a few ways you’ll know whether using a Waterless Car Wash is right for your business. Have some other ideas? Let us know!